The Brown Creeper is the only tree creeper in North America. It is very small: males 12.0 to 13.5 cm (4.7 to 5.3 inches) total length; females 11.7 to 13.2 cm (4.6 to 5.2 inches) total length. Average body mass for both is 7.2 to 9.9 g. Adult plumage is dark-brown on the upperparts, extensively streaked with dull whitish on head, back, scapulars, and wings; it has a distinctive brownish-white supercilium. Underparts whitish washed with cinnamon distally. The bill is slightly decurved, the tail long and stiff (Hejl et al. 2002). The combination of brown and white coloration, very small size, and tree-creeping behavior distinguish this species from all other North American birds. Brown Creepers breed from south-central Alaska east to Newfoundland and south through the Great Lakes states, New England, and along the Appalachian Mountains to North Carolina and Tennessee in the east and down the western mountain ranges and through the highlands of Mexico to northwestern Nicaragua in the west. They winter within most of the breeding range as well as at lower elevations throughout the continental U.S. and northeastern Mexico. Permanent resident in the western part of Montana; an uncommon migrant, breeding resident, and winter visitor elsewhere. In Bozeman area, vertical movements and/or migrations occur February 20 to April 20 and September 10 to October 30 (Skaar 1969). 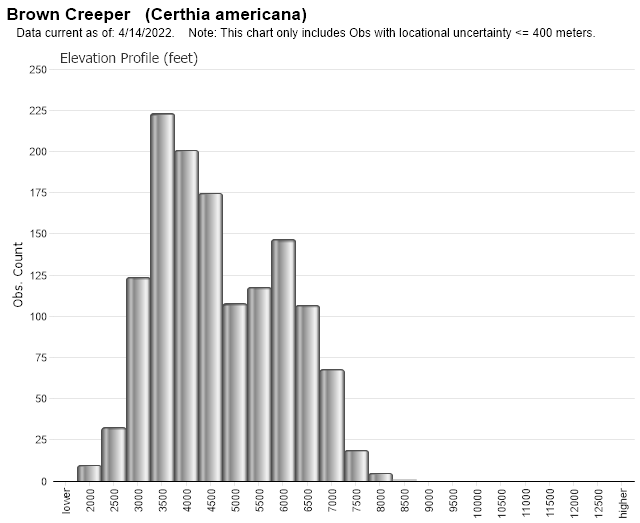 Creepers breed in coniferous and mixed coniferous-deciduous forests, preferring mature and old-growth stands with high canopy cover in the western U.S. (Hejl et al. 2002). Hutto and Young (1999) found that they were more common in mature western redcedar-western hemlock, spruce-fir, and mixed-conifer forests than in pine or younger forests in western Montana and Idaho. They winter in the same habitats used for breeding but also use a wider diversity of forest types, including uplands dominated by deciduous trees, urban and suburban parks and residential areas that contain large trees, and riparian cottonwoods. The consistent factor appears to be the need for large trees and snags (dead trees) for foraging and nesting microsites. Brown Creepers are the only North American birds that build their nests behind loose pieces of bark on tree trunks. They prefer to nest in large dead or dying trees within dense forest stands, placing their nests from <1 m to >20 m above the ground (Hejl et al. 2002). For 19 nests in mixed conifer forests of western Montana and east-central Idaho, 5 were in subalpine fir, 5 in Douglas-fir, 4 in Engelmann spruce, 3 in lodgepole pine, and 2 in western larch; all nest trees were dead and all but one in unlogged forest stands (Hejl et al. 2002). Forages primarily on trunks of live trees. In winter main foods taken include a variety of insects and larvae, spiders and their eggs, ants, and pseudeoscorpions; a small amount of seeds and other vegetable matter. Breeding season diet is the same as in winter, but possibly no vegetable matter is eaten (Hejl et al. 2002). In using their tail for support, creepers are evolutionarily convergent with woodpeckers. Because it is energetically cheaper to climb upward than to fly vertically (Norberg 1981), foraging creepers invariably work their way up a tree trunk on foot and then fly down to the base of the next tree to resume the process. The ability of the Brown Creeper to use cryptic coloration to avoid detection by a predator was documented in the Flathead National Forest (McClelland 1975). When startled by a slight movement, an adult that had been ascending a trunk toward its nest suddenly froze, pressing its body and outstretched wings tightly against the tree. It was so well camouflaged against the bark that it required several minutes to relocate; the creeper remained stationary for another 5 minutes after relocated. The BBS is poorly suited for monitoring this species (Hejl and Paige 1994). Data indicate a decline in numbers of 0.3% per year survey-wide from 1980 to 2007 and an increase of 12.8% per year in Montana during the same period; the Montana trend data are derived from small sample sizes and thus are not reliable. 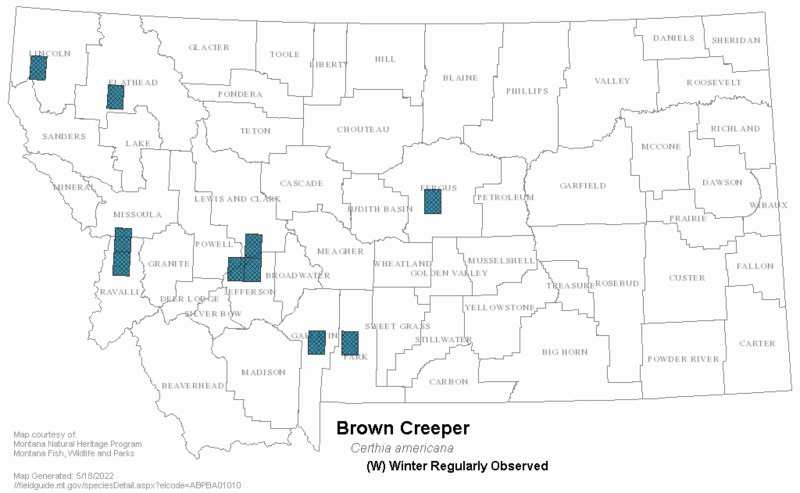 CBC data during winter 1979-80 through 2009-10 show Brown Creepers were reported every winter, but with wide fluctuations in numbers, generally in a 2-4 year cycle, and no particular trend; high total count was 106 (0.0653/party hour) on 14 counts in 1998-99, low total count was 13 (0.0092/party hour) on 6 counts in 1995-96. 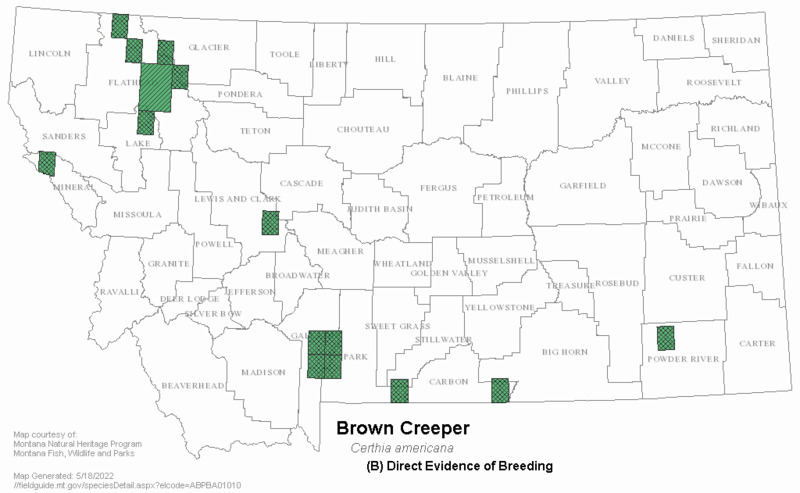 Little information exists on the timing of breeding events by Brown Creeper in Montana, but several nests have been found in Flathead and Lewis and Clark counties in June and July (Montana Bird Distribution Committee 2012). The earliest initiation date for 19 nests found in western Montana and east-central Idaho was 7 May, and the median date was 2 June (Hejl et al. 2002). The nest is built in two parts, base and nest cup, behind a piece of peeling bark. The subelliptical eggs are white, speckled with pink or reddish-brown. Clutch size is usually 5 or 6 eggs (Hejl et al. 2002). 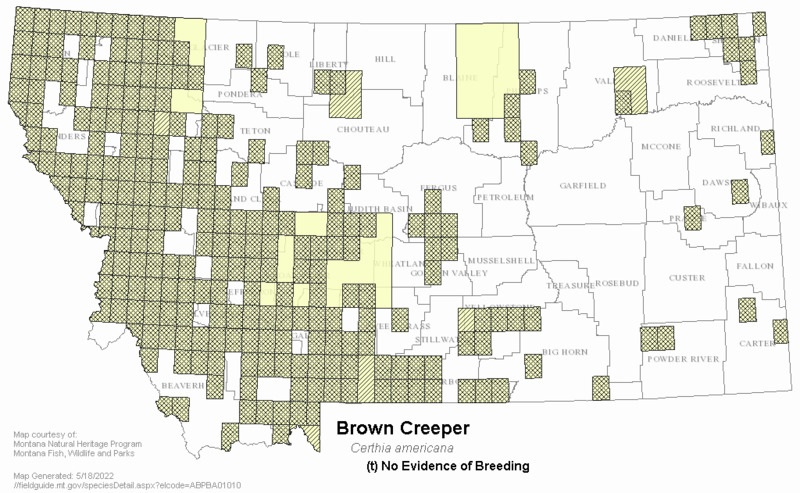 No management activities specific to Brown Creeper are currently occuring in Montana. Maintaining large blocks of unlogged old-growth and mature forest with high densities of large trees, dying trees, and snags would be especially beneficial to this species. (Casey 2000, Hejl et al. 2002). Concern for this species results from its strong association with unlogged old-growth forest, especially stands of cedar-hemlock, which are uncommon in Montana and are highly productive for timber (Casey 2000). Creepers are always less abundant in clearcuts or partially logged forests than in uncut areas (Hejl et al. 1995). Hejl, S.J. and L.C. Paige. 1994. A preliminary assessment of birds in continuous and fragmented forests of western red cedar / western hemlock in northern Idaho. In: Proceedings of interior cedar-hemlock-white pine forests: ecology and management. p. 189-197 Department of Natural Resource Sciences, Washington State University, Pullman, WA. McClelland, B. R. 1975. 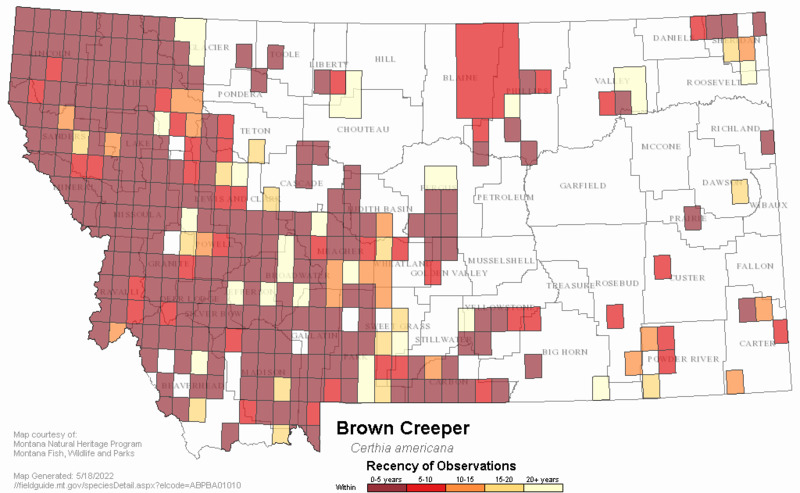 Effectiveness of brown creeper's concealment behavior. Western Birds 6:24. Norberg, R.A. 1981. Why foraging birds in trees should climb and hop upwards rather than downwards. Ibis 123(3): 281-288. Adams, E. and M.L. Morrison. 1993. Effects of forest stand structure and composition on red-breasted nuthatches and brown creepers. J. Wildl. Manage. 57(3): 616-629. Franzreb, K.E. 1985. Foraging ecology of brown creepers in a mixed-coniferous forest. J. Field Ornithol. 56(1): 9-16. Keller, M.E. and S.H. Anderson. 1992. Avian use of habitat configurations created by forest cutting in southeastern Wyoming. Condor 94: 55-65. Mariani, J.M. and D.A. Manuwal. 1990. 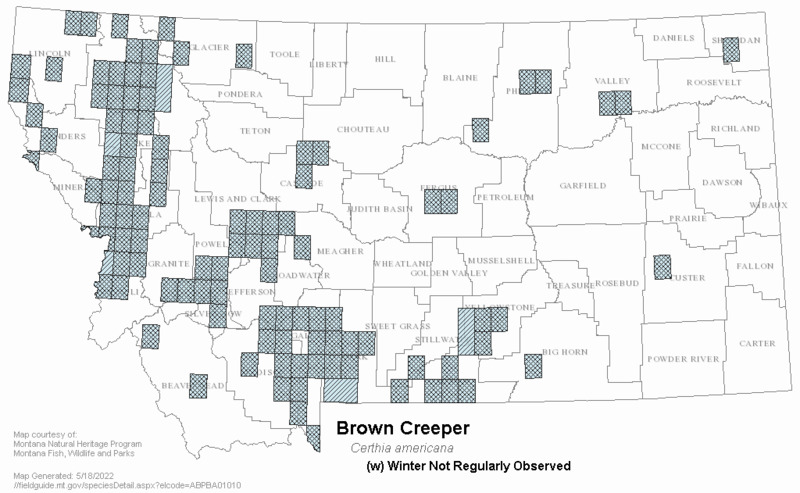 Factors influencing brown creeper (Certhia americana) abundance patterns in the southern Washington Cascade Range. Stud. Avian Biol. 13: 53-57. Scott, V.E. 1979. Bird response to snag removal in ponderosa pine. Journal of Forestry 77(1): 26-28. Scott, V.E., J.E. Whelan, and P.L. Svoboda. 1980. Cavity nesting birds and forest management. Pages 311-324 in Management of Western Forests and Grasslands for Nongame birds. U.S. For. Serv. Gen. Tech. Rep. INT-86. 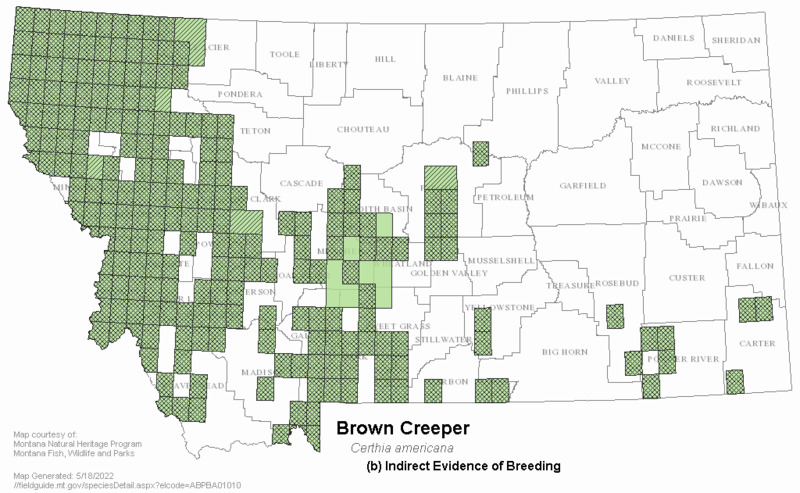 Web Search Engines for Articles on "Brown Creeper"